The world of leadership has changed dramatically since 100 Ways to Motivate Others was written, and now Chandler and Richardson have revised and refreshed their organizational classic to meet the times. They have crafted a vital, user-friendly, inspirational guide for executives, managers, and professionals…and those aspiring to reach their level. 100 Ways to Motivate Others is based on years of successful live workshops, seminars, and personal coaching programs on communication and leadership. • How to slow down and enjoy a new level of focus. • How to build on your peoples’ strengths. • A simple and creative way to hold people accountable. • How to enjoy cultivating the art of supportive confrontation. 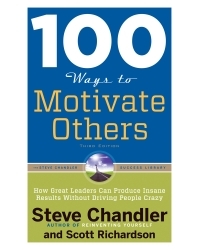 Steve Chandler is one of America’s best-selling authors whose dozens of books—including the best-sellers 100 Ways to Motivate Others, 100 Ways to Motivate Yourself, The Hands-Off Manager, and Reinventing Yourself—have been translated into more than 25 languages, with best-sellers in China and Japan. He is also a world-famous public speaker who has been a guest on hundreds of radio and TV shows. Chandler has been a guest lecturer at the University of Santa Monica where he teaches in the graduate program of soul-centered leadership. He has been a trainer and consultant to more than 30 Fortune 500 companies worldwide. Scott Richardson graduated from The College of Law at Arizona State University and has been practicing for more than 25 years and has been coaching executives for more than a decade. Chandler and Richardson live in Arizona, and provides leadership coaching and training throughout the world.